Dairy Queen will introduce their new Chili Meltdown GrillBurger in September, with national advertising for the new burger beginning next week. The Chili Meltdown GrillBurger is made with two quarter-pound beef patties, diced onions, two slices of American cheese and topped with chili. "No question that you’ll need plenty of napkins to enjoy this one," said Michael Keller, chief brand officer for International Dairy Queen, of the new GrillBurger. "Our GrillBurgers are a cut above the rest in the quick service category, and with the Chili Meltdown GrillBurger, we’ve added a new twist with some good-old-fashioned chili, which has always been an intriguing flavor combination. 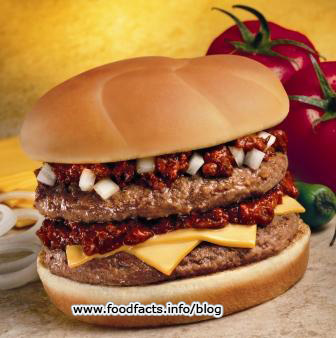 The average retail price of the half-pound DQ Chili Meltdown GrillBurger is $3.79. A quarter-pound version is also available for $3.25. Basket deals, which include French fries and a soft drink, are $6.15 and $5.15 respectively. Nutrition information has not yet been provided. "Nutrition information has not yet been provided." The larger 1/2 pound version of the Chili Meltdown Grillburger has 840 calories (450 of those from fat), 50g fat, 19g saturated fat, 3.5g trans fat, 115mg cholesterol, 1720mg sodium, 44g carb, 3g fiber, 9g sugars, and 51g protein. Note that, although the thing is high in protein, the sodium and fat are practically off the charts. A whopping 54% of its calories are from fat, not protein. And the amount of saturated fat is 95% of the recommended limit for the entire day. or increased priced that you'd need to supply far from your entire body just before working in to the ocean.